This is the first year that we've been able to put up lights on our house. It was a pretty exciting experience. Zoë especially likes it and waits by the window at dusk waiting for the colored lights to illuminate. Then she wants to run outside to look at them. 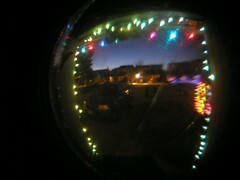 This picture is of our entry way lights taken through the peephole of our house. Weird, I know... but for some reason I find it very appealing.